This past weekend, I had the chance to join colleagues from across the country to celebrate the arrival of the Dawn spacecraft at Dwarf Planet/Asteroid 1 Ceres – the largest object in the main asteroid belt. After more than seven years cruising through the solar system, including an amazing year exploring asteroid 4 Vesta, Dawn has now arrived at its second destination. To celebrate this exploration of a new world, the Dawn team invited representatives from a wide range of NASA and ESA missions from across the world. 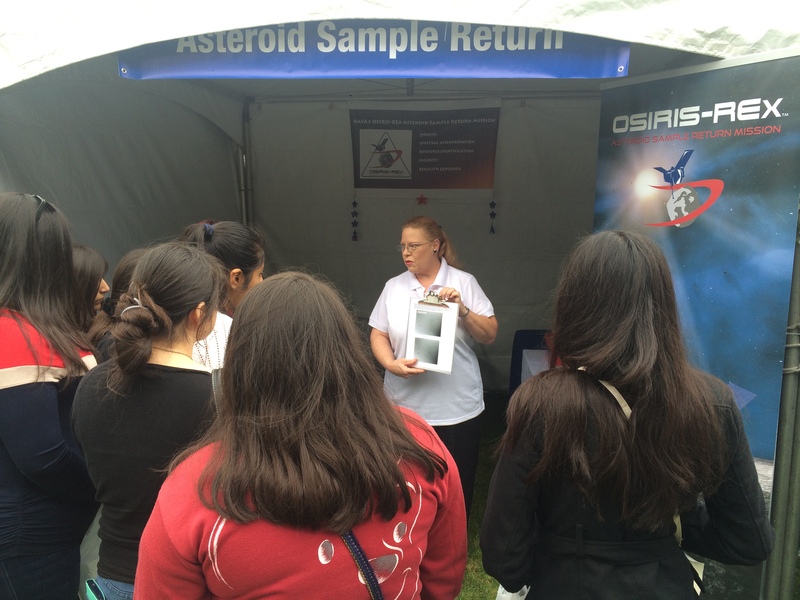 OSIRIS-REx team member Dolores Hill educates people about our exciting sample-return mission. OSIRIS-REx was well represented at this event. Our team set up a booth on the lawn at CalTech and distributed materials about the mission. We also had an interactive activity to demonstrate how we discover and characterize asteroids throughout the solar system. We ran a Twitter treasure hunt – where people received a prize for whispering a secret phrase to one of our team members. Watch for more of these at future public events! Finally, I participated in a panel with other mission leaders, discussing the challenges and excitement of exploring small bodies in the solar system. 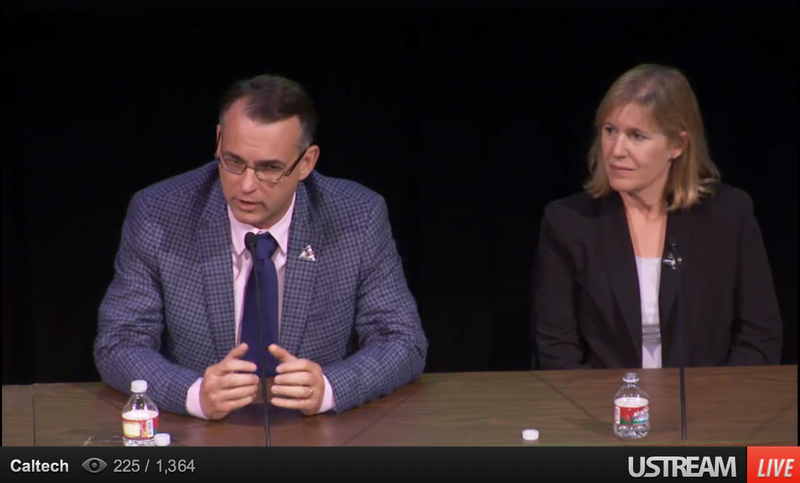 The i C Ceres event included a panel discussion with several leaders of small body missions. I am on the left and Carol Raymond, Dawn Deputy PI, is on the right. Dawn is a mission of true exploration. At each target, Dawn reveals a new world by acquiring color photographs, mapping the elemental and mineralogical composition, measuring the gravity field, and searching for moons (none found so far). This mission is unique for the many reasons. 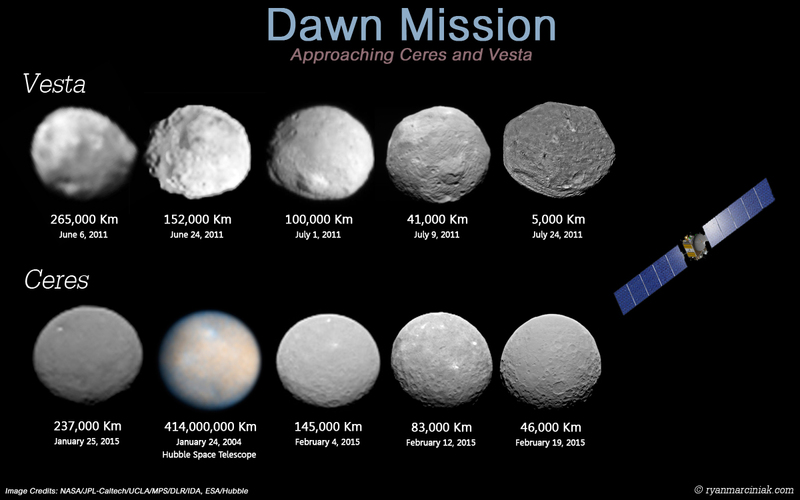 Dawn is the first mission to visit Ceres and the first mission to visit Vesta. As a result, Dawn is the first spacecraft to orbit two extraterrestrial bodies. 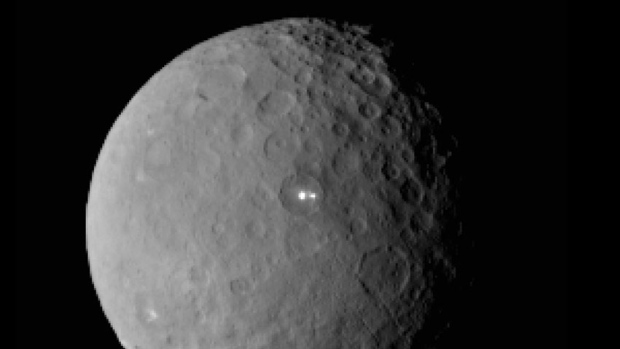 When Dawn arrived at Ceres in March 2015, it became the first spacecraft to visit a dwarf planet. New Horizons flies by Pluto, another dwarf planet, in July – making 2015 the year of the dwarf planet. Many people remember the controversy surrounding Pluto’s demotion to a dwarf planet, reducing the total number of planets from nine down to eight. According the International Astronomical Union, a dwarf planet is round and orbits the sun, but is unable to clear its orbital path such that there are no similar objects at roughly the same distance from the sun. 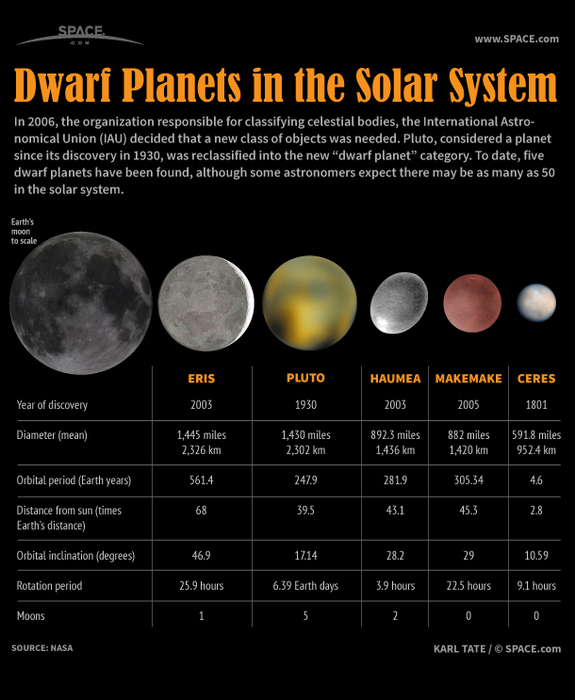 Most dwarf planets reside in the outer solar system, beyond Neptune. Ceres is the only dwarf planet in the inner solar system. Vesta and Ceres straddle a boundary in the asteroid belt between primarily rocky bodies and ice-bearing bodies. Vesta is a dry, differentiated object, shaped by volcanism, with a crust that shows signs of resurfacing. 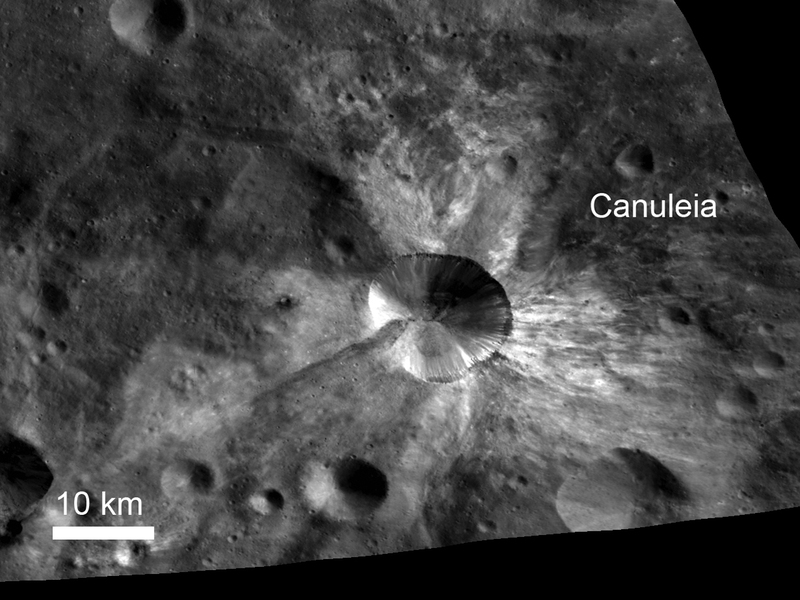 Data from Dawn revealed the presence of anomalous dark spots and streaks on Vesta’s surface, which correspond to dark inclusions found in the HED meteorites, long suspected to originate from Vesta. These dark inclusions were likely deposited on Vesta by ancient impacts involving carbonaceous asteroid impactors. Based on measurements of its mass, shape, volume and spin state with radiometry and imagery, Dawn confirmed the presence of a core inside Vesta and placed constraints on its size. Ceres is likely an icy, volatile-rich planet containing abundant hydrated clay minerals. It is the largest, most massive object in the main asteroid belt, with an average diameter of 950 kilometers (about 590 miles). It may possess a very tenuous atmosphere. Spectral characteristics of Ceres from ground-based telescopic data suggest it has a surface composition similar to carbonaceous chondrite meteorites. In January 2014, the Herschel Space Telescope detected emissions of water vapor from several regions of Ceres. 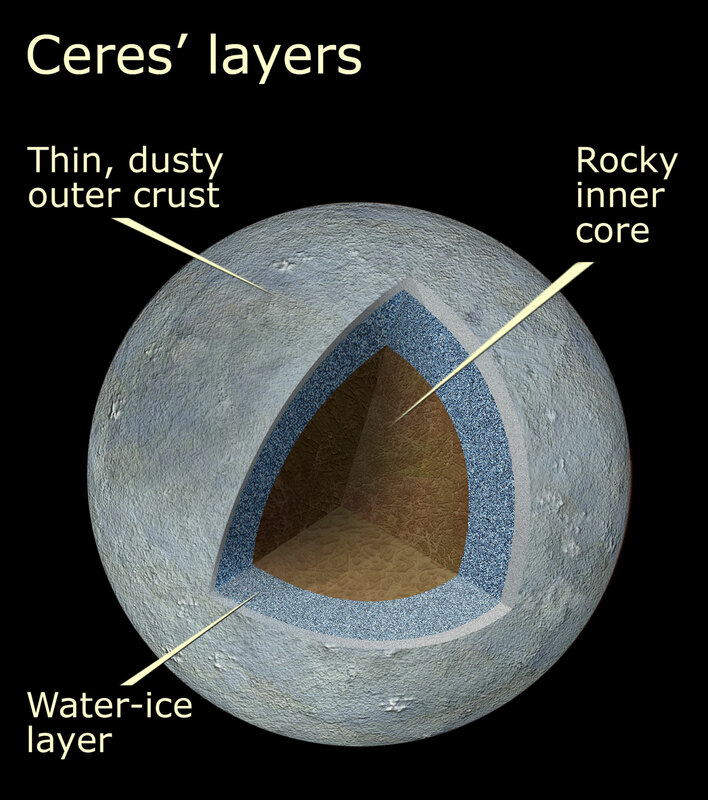 These data provide clues that Ceres contains large amounts of water ice beneath its surface. The vapor may be produced by cryovolcanoes or by ice near the surface sublimating (transforming from solid to gas). We estimate that if Ceres were composed of 25 percent water, it might have more water than all the fresh water on Earth. Ceres’ water, unlike that found on Earth, cannot remain liquid on the surface. The water is probably located in the mantle beneath the surface in the form of liquid water, ice and hydrated rock. By studying both of these two distinct bodies with the same complement of instruments on the same spacecraft, the Dawn mission hopes to compare the different evolutionary path each took, and create a picture of their diverse early solar system histories in the main asteroid belt. The recent images from Dawn show bright spots associated with recent impact craters on the surface of Ceres. This correlation suggests that the bright material is under the surface of the asteroid and is only exposed when another asteroid impacts the surface and excavates the subsurface, bright material. In addition, the Herschel detection of water vapor correlates spatially with the locations of the bright material. These data all suggest to me that the material is water ice recently exposed on the surface. However, we won’t know for sure until Dawn has a change to collect spectral data of these regions – which will provide a much stronger constraint on their composition. Stay tuned for more fascinating data from this exciting exploration mission!